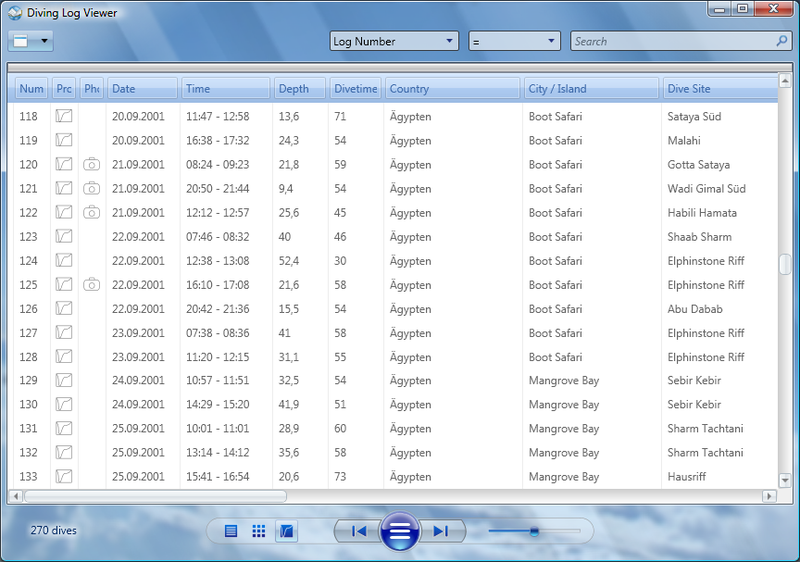 The Diving Log Viewer is a program to view Diving Log logbooks and is based on the new Microsoft WPF (Windows Presentation Foundation) Technology. 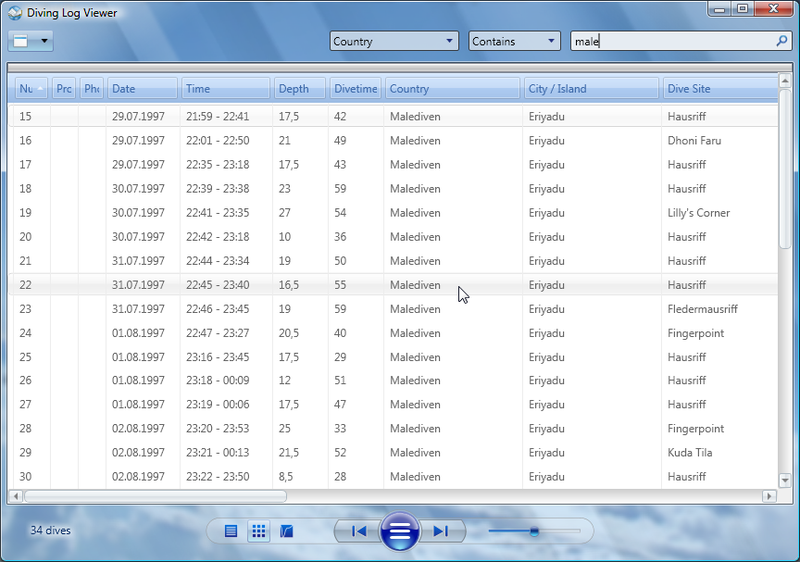 It is designed for Windows Vista, but runs also well on Windows XP and requires the .NET Framework 3.5. No installation is required and it can also run from a USB stick. 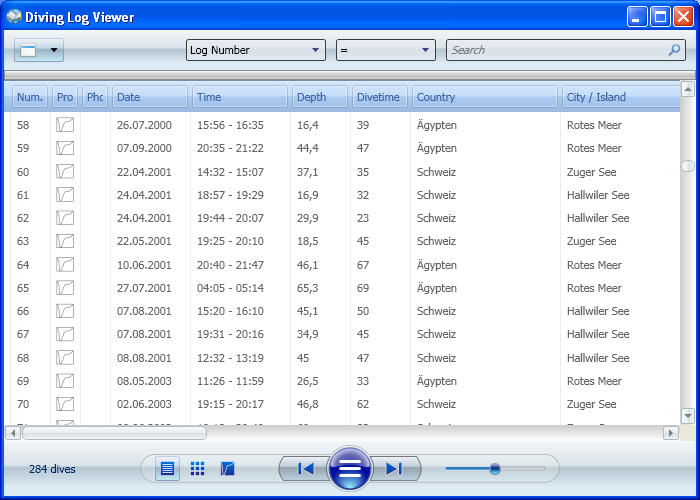 The program is free for everyone without any limitations (Freeware). In the top left corner you can find the menu . 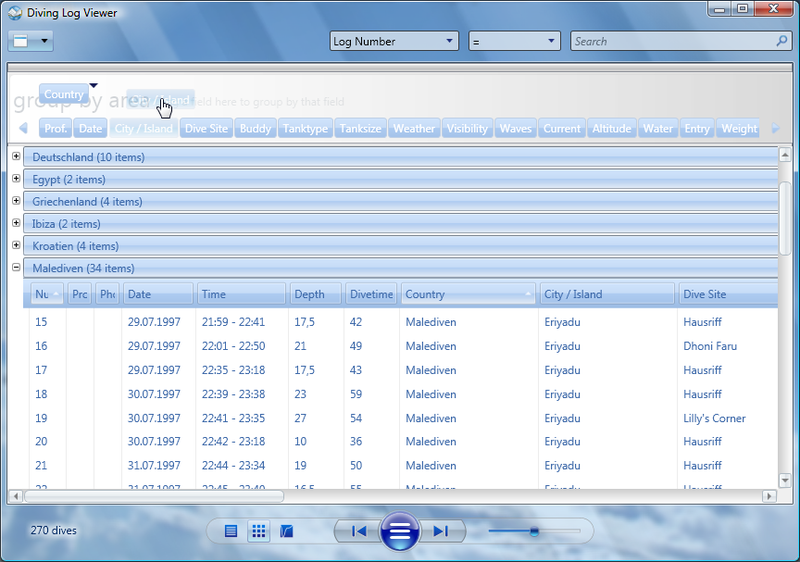 In the top right corner are 3 fields to search the logbook data with several options (e.g. "contains", "begins with", "<=", ">="...). The results were displayed immediately (instant search). Search for countries containing "male"
The small bar below opens the "group by area", where you can group one or more fields of your logbook. You can combine more fields, e.g. group by Country, City / Island and Dive Site. To group by a field, simply drag it with the mouse a little bit up into the free area. 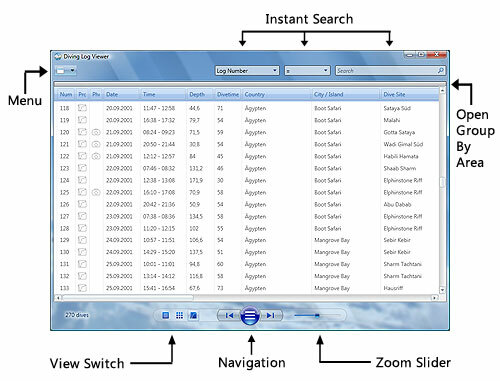 You can also use the search and group function at the same time. In the center the dive list is displayed. When you click with the mouse into the list, either the comments, the thumbnails or the profile is displayed. To switch between the views, click on one of the 3 buttons at the bottom (View Switch). You can switch directly from the comments to the thumbnails or the profile and vice versa, without the need to display the dive list first. In the center at the bottom you can find the navigation to browse through the dives and photos. On the right side the zoom slider is located. You can zoom the comments, thumbnails, single photo and profile. In the dive list view it has no functionality. You can open the Viewer at the same time as Diving Log. 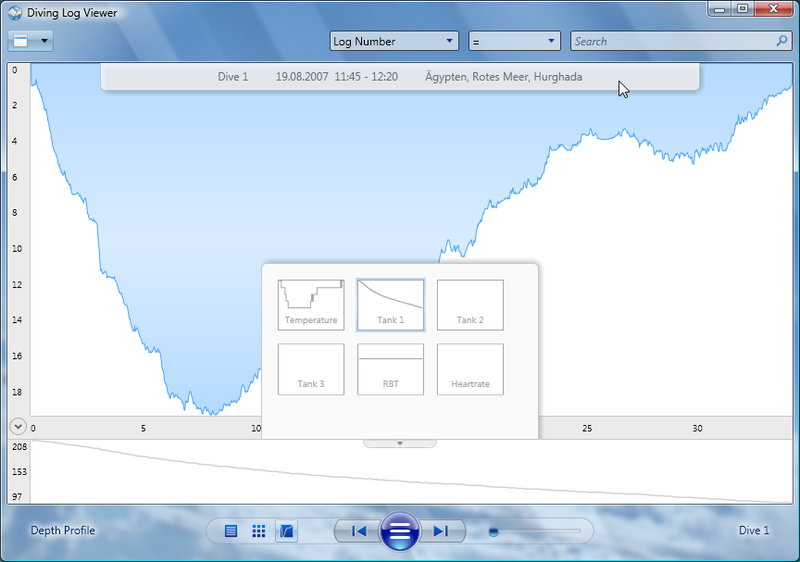 When you make changes in your logbook data in Diving Log, the Viewer will automatically refresh after a few seconds. In the comments, thumbnail and profile view the navigation buttons move one dive forward or backward. 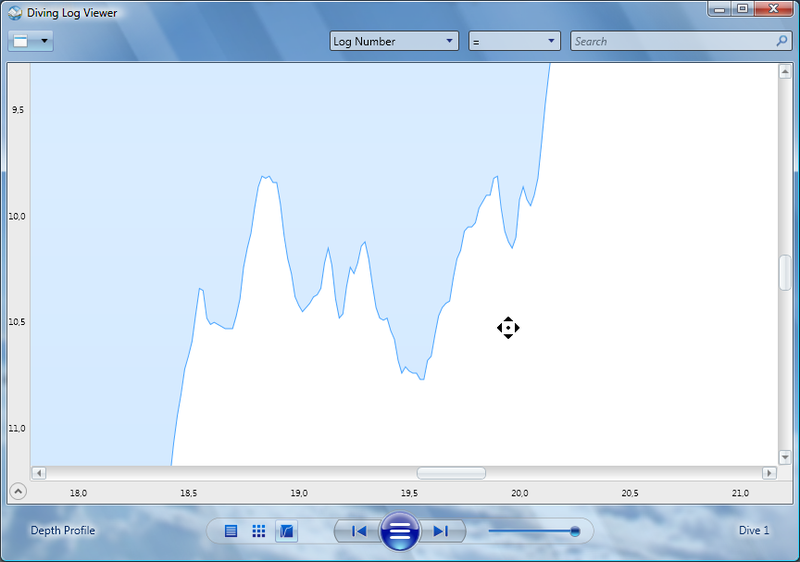 In the single photo view they show the previous or next photo of the same dive. The round button in the center switch always back to the dive list, no matter in which view mode you are. In the dive list view it switches back to the previous view. The comments can be displayed in 3 different ways, single page view, 2-page-view and scroll view. You can switch between these modes with the 3 buttons in the lower right corner, but the difference is only visible when a lot of text is displayed. 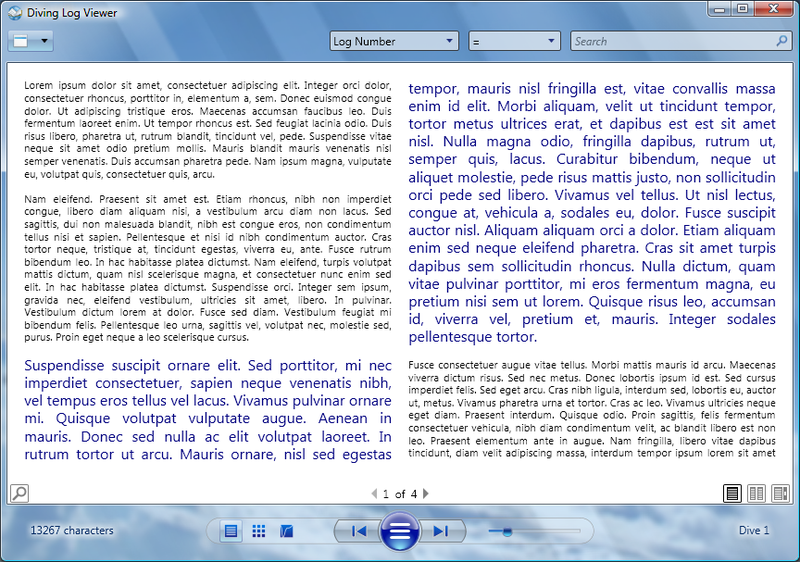 With the zoom slider you can change the font size dynamically. When you move the mouse to the top border the basic dive data is displayed. You can change the size of the thumbnails with the zoom slider at the bottom. When you move the mouse above a thumbnail, a tooltip with the exif data (if available) is displayed (date, aperture, exposure time...). When you move the mouse to the top border the basic dive data is displayed. When you click on a thumbnail the picture will be displayed. 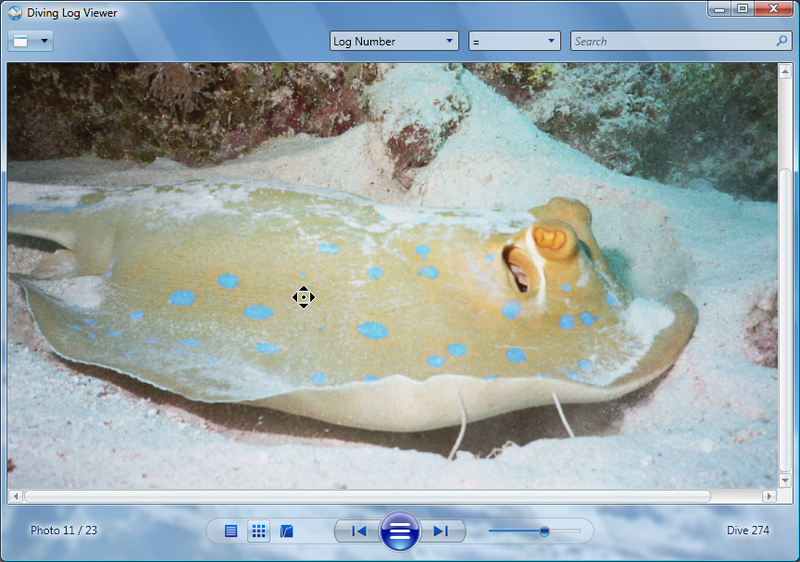 In the photo view you can zoom the image with your mouse scroll wheel (or with the zoom slider at the bottom). You can pan the image when pressing and holding the right mouse button and drag it around. 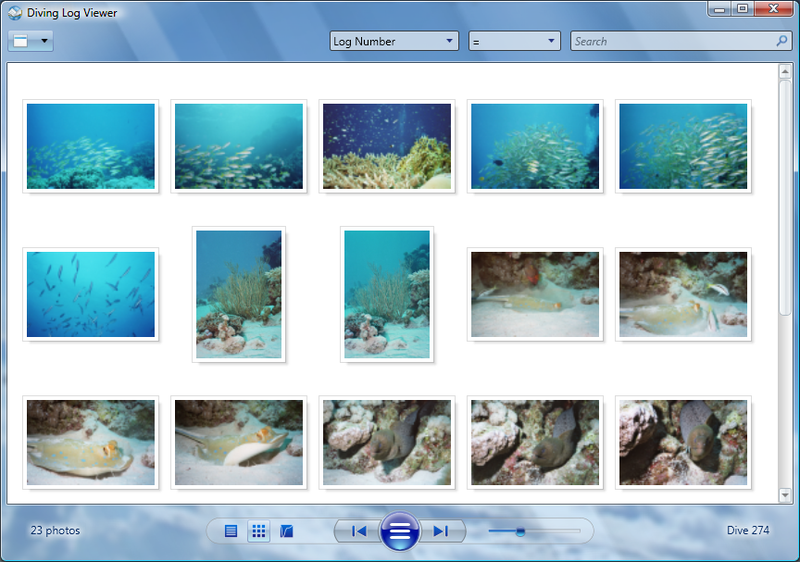 With the navigation buttons you can navigate through the photos of the dive. With a left click you close the image and return to the thumbnail view. 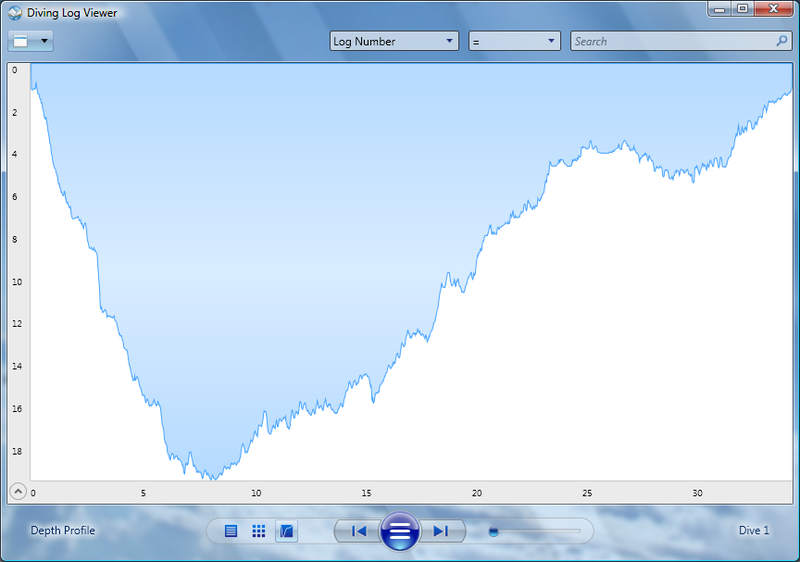 In the profile view you can zoom the image with your mouse scroll wheel (or with the zoom slider at the bottom). You can pan the profile when pressing and holding the right mouse button and drag it around. With the round button in the lower left corner you can display the secondary profile (temperature by default). You can view all available profiles in a popup with the button at the upper side of the sec. profile. When using the viewer on Windows Vista you don't need anything else, on Windows XP you must install the .NET Framework 3.5. Feedback, questions and comments are always welcome, either in this thread or via email.